Our General Fund is for tithes and offerings. Our Building Fund is to support our new church building project as well as for maintenance on our existing facility. The Missions Fund is to support our various missionary teams. 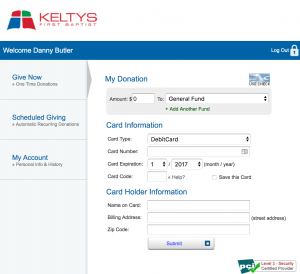 If you are not a member and wish to donate to Keltys, open the portal and select quick give. This does not require login. If you are a member, please login so that your contribution will be reflected in your membership record. 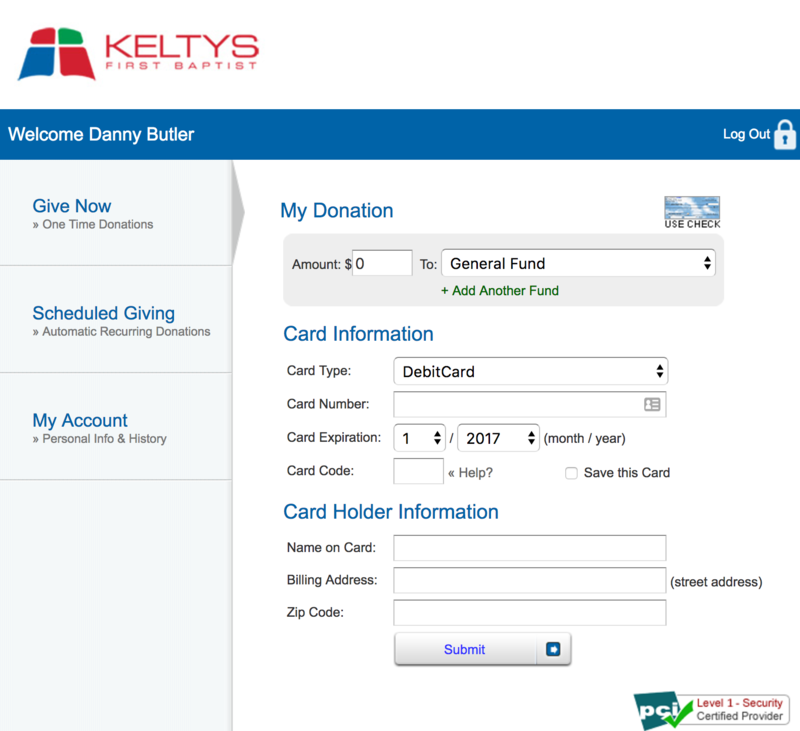 You can use the instructions below to setup your giving portal and contribute to Keltys. You can create an account and give via the portal. If this is the first time you have used the portal, you will need to get a password. Click on the “First Time?” link in the left hand navigation pane. Check your email for your new, temporary password. If you do not receive a temporary password or the email includes an error indicating that your account does not exist, we have the wrong email address on file for you. See note #3 below. Use this to login to your account. You will be asked to change your password. Input the amount, the fund that you will be contributing to and the method for checking account withdrawal (eCheck/ACH). Input the routing number and account number as directed. It may take two to three days for the contribution to clear the online payment process and show up as a withdrawal in your bank account. Scheduled Giving follows a similar process, complete the forms for recurring payments. Install the appropriate app using one of the links above. After installing, retrieve a password by inputting the domain and following the “Forgot Password” process. Check your email for a password. You should now have a “Give” option in the application. Follow the prompts to set up a one time or recurring contribution. If you do not receive a temporary password for either method, it is likely that Keltys does not have the correct email address on file for you. Fill out this form and wait for a response from an administrator.